LVR Calculator will help you work out what loan to value ratio amount, being the amount you borrow. Loan to value ratio (LVR) represents the value of a property used as security in the form of a percentage. LVR allows you to find out the financial value of a property, and helps you decide whether you need to have lender mortgage insurance (LMI) or a low deposit premium on your home loan. Normally, you must have the LMI or a low deposit premium if a bank gives you a loan that is more than 80% of the property value. Banks and other financial institutions always stress on the LVR when evaluating your loan application. The higher the loan to value ratio, the higher the risk is to the lender. Whereas, a lower LVR means the lender will have to bear a low risk because you have put in more deposit. How is Loan to Value Ratio Calculated? How to calculate LVR when you get a low valuation? How to calculate LVR for an off the plan purchase? How to calculate LVR with a guarantor home loan? How to calculate LVR on a construction Loan? How to calculate LVR for Refinance? Does Your Property Need a Valuation? What is the Maximum LVR Amount Allowed? What is a High-Risk LVR? Why do Banks Put a Cap on LVR? The calculation of LVR is quite simple. Divide the loan value by actual purchase price or property value and multiply it by 100. For example, if you are borrowing $300,000 and the property you are buying (or refinancing) is worth $375,000. In this example, the loan amount $300,000 is divided by the property value $375,000 and gives an amount of 0.80 or an LVR of 80%. However, if the loan amount is the same but the property value is $378,000, the LVR will be around 79%. In this case, no LMI or low deposit premium is required. In this example, the loan amount $300,000 is divided by the property value $378,000 and gives an amount of 0.79 or an LVR of 79%. You must know that lenders do not consider the price you pay for the property. Instead, they determine the value of a property through their own bank valuation. It is possible that the price determined by the valuer is different from the purchase price of a property, which we will get into shortly. Having an LVR of 80% or less (e.g. 79%) means you avoid paying lenders mortgage insurance. If you were looking at purchasing a property for $600,000 but the lender’s valuation comes in at $590,000 how do you calculate LVR? Let’s assume your loan amount is $480,000. Unfortunately, the bank would adopt the lower of the valuation and purchase price – so they would calculate LVR using $590,000. In this example, the loan amount $480,000 is divided by the property value $590,000 and gives an amount of 0.8135 or an LVR of 81.35%. The purchase price of $600,000 would be ignored by the bank and the lower value would work. As the LVR is now over 80% it would be considered slightly higher risk, and require Lenders Mortgage Insurance to be paid. The good news is if you have purchased the property subject to finance, you could look at getting out of the contract, or negotiating a lower price with the purchasers or even getting another bank valuation. A low valuation isn’t the end of the road. You can talk to the agent to negotiate a reduction in the purchase price. There can be cases where you have bought a home off the plan over 18-24 months before you need to settle the property and by the time settlement comes around the value of your home has increased. So what happens to the LVR if you bought a property for $350,000, want to borrow $300,000 and the bank valuation comes in higher at $400,000? In this example, the loan amount $300,000 is divided by the property value $400,000 and gives an amount of 0.75 or an LVR of 75%. The purchase price of $350,000 would be ignored by the bank provided 12 months has passed. As the LVR is now UNDER 80% it would be considered lower risk, and not require Lenders Mortgage Insurance. Buying off the plan can be good and bad depending on the final LVR. Calculating LVR on guarantor home loans is done in much the same way, except in this scenario you have 2 houses being used as security instead of just 1. Let’s say you were looking at buying a home for $500,000 and wanted to borrow 105% LVR giving a total lending amount of $525,000 as a guarantor home loan how is the LVR calculated? 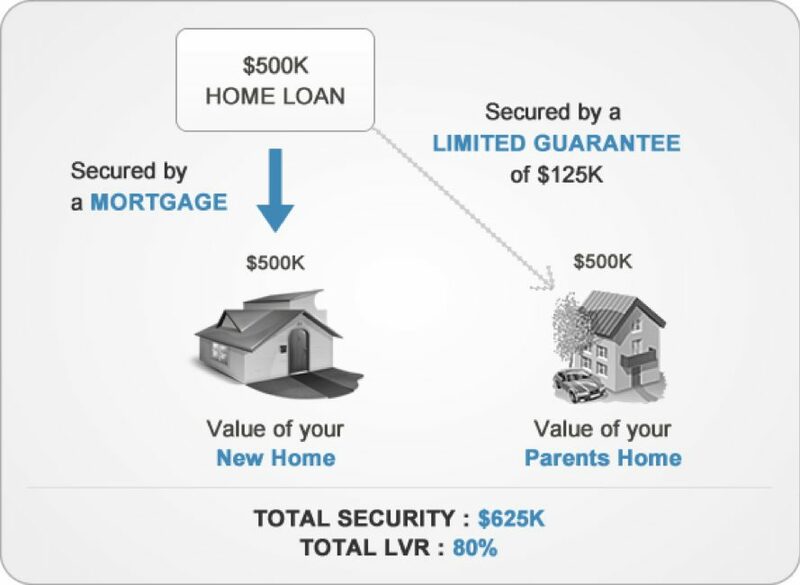 This is an example of a typical guarantor home loan structure, with a maximum LVR of 80%. The total lending amount is $525,000 with $400,000 being secured against your home, and $125,000 secured against the guarantors home. With guarantor home loans the bank will structure 2 loans. First, the bank will lend 80% LVR against the property you would like to purchase: Being $400,000 total lending. In this example, the loan amount $400,000 is divided by the purchase price $500,000 and gives an amount of 0.80 or an LVR of 80%. Lenders Mortgage Insurance is not payable as the loan is under 80% LVR. And the second part, against your guarantors home, in this case, it would only be a 25% LVR against your parents home being the balance or $125,000 in lending. In this example, the loan amount $125,000 is divided by the purchase price $500,000 and gives an amount of 0.25 or an LVR of 25%. Overall guarantor lending can allow you to have an LVR over 100% but requires a guarantor to provide their property. If you were looking to buy some land for $300,000 and build a home for $300,000 how would LVR be calculated on your construction loan assuming the bank’s valuation was for $600,000 as if complete? What LVR would you get if you borrowed $270,000 against the land and $270,000 towards the build part? In this example, the loan amount $270,000 is divided by the vacant land value $300,000 and gives an amount of 0.90 or an LVR of 90%. Lenders Mortgage Insurance would be payable and added on top of the loan. The second part of calculating the LVR on a construction loan is using the as-if complete value being the combined amount of the land and the construction totalling $600,000. In this example, the total loan amount $540,00 is divided by the complete property value $600,000 and gives an amount of 0.90 or an LVR of 90%. Lenders Mortgage Insurance would be payable and added on top of the loan. With construction loans, the lender would also look at the build costs, and make sure they fit within industry metrics. If you are overpaying for the construction costs you could get a low bank valuation. If you wish to refinance your own property, banks will do their own property valuation to figure out the loan to value ratio. The reason is quite simple. You might have bought your house two or three years ago and its price is no longer relevant. It is also possible that you did the renovation, which changed the value of a property. In such cases, an independent valuation is a more reliable option. You do not always need a bank valuation to determine LVR, but it depends on a few conditions. ✅ If you are applying for a home loan or an investment loan. If you provide a complete set of documents, the maximum LVR amount you are allowed to borrow is 95% for purchases or up to 90% LVR for refinances. The banks regularly change their policy on how much they will allow as their maximum LVR, so talk to our team of experts to see what you can qualify for. If the loan amount is over 80% LVR, lenders consider it higher risk. This is why you need to have LMI if the loan value is more than 80% LVR. You can reduce the overall risk associated with the loan if you have LMI. It also allows banks to approve your loan without any risk of losing their investment. Your job also plays into making you a higher risk, than not with some specific jobs able to get 90% LVR with no LMI. Banks restrict your LVR if you are a high-risk borrower. For example, if you wish to purchase a property for $600,000 and apply for a home loan of $525,000, your LVR will be 87.5%. But you may only get an approval for 80% LVR due to bad credit history. The bank may also reduce your LVR if it is not easy to sell your house. Our team at Hunter Galloway can help you gain a detailed understanding of LVR and will help you find the right lender.